Your publisher is hurting you, and I don’t mean in that ABC After School Special way. Your publisher isn’t promoting your books like they promote others and it’s killing your reviews and sales. But #weneeddiversebooks! Readers shout it, your publisher tells you they agree. Then tell me why the pitches I receive are so white. And it’s not just books by already popular authors that they’re pitching. They’re authors no one has ever heard of, but the publisher has decided they’re worth promoting even though their synopsis reads like hot garbage. What do you mean, Lisa? Here’s a screenshot of December pitches, a publisher's giveaway and the Goodreads monthly newsletter. Month after month, week after week, I receive pitches from publishers and rarely do they offer books by authors of colour. On a rare occasion, I come across a black or Latina publicist who offers me books that don’t necessarily interest me, but if they have characters of colour or an author of colour, I’ll likely accept them because I want them to know that someone is interested in books by authors that aren’t white. But why should I have to wait for a publicist of colour for that? In the seven years that I’ve been blogging, I can count on one hand the number of publicists I’ve encountered that aren’t young, white women. And young white women are going to pitch books that interest them. I don’t need another book about any of the Brontes. I don’t give a flying fig about Mr. Darcy. But over and over again, that’s what clogs my inbox. While Netgalley has some of the bigger publishing houses listed, along with a number of indie houses, Edelweiss is a clearinghouse for almost all of the larger publishing houses. 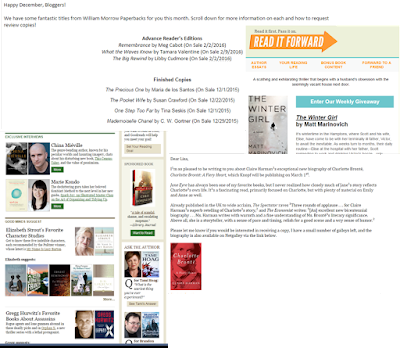 Booksellers, librarians and bloggers can read publisher catalogs (and I do faithfully), make note of what new books are in the pipeline, and add them to their to be read or to be bought list. Everything listed in the catalog doesn’t become available to download as an ARC, but a good number of books are. And this is where we run into the problem. Some publishers, like Simon & Schuster and Harper, do a really good job of making books available to reviewers on Edelweiss. Why? Because they know that if the reviewer likes the book, they’ll write a post about it. If they love the book, they’ll tell everyone they come in contact with in real life and on social media about it. Sometimes I get books six months in advance. That means I have six months to shout from the rooftops about how good your book is. What happens when ARCs aren’t made available? Reviewers have to wait for release date like everyone else, which means there’s no release day promotion for you other than a tweet, a short Facebook post, etc. informing people you have a new book out ̶ not much to motivate people to buy your book. Even worse, there are publishers that list ARCs so that you can request them, but then never respond to your request. Why even list the book if you have no plans to actually allow reviewers to read it? I hate to tell you authors, but some of your publishers are so non-responsive that I move your book down to the bottom of my to be read list when that happens. Right now that list is at 499, so good luck on getting that review in the year your book is published. And there is one publisher I will never request a book from again because they've not responded to any requests in two years. As a matter of fact, I try to avoid reading any authors on their imprint. I hate to break it to the romance authors among you, but you’re missing out the most. Harlequin and Kensington post ARCs on Netgalley, but it’s not often that your books appear among them. Of 41 books currently posted on Netgalley by Kensington, there is only one book by an author of colour, appearing under the Dafina imprint. Harlequin fares a little better, but not by much. With 66 books posted on Netgalley, three are by authors of colour, published under the Kimani imprint. On Edelweiss, Kensington lists 172 books on their frontlist and several of the 58 on their Dafina imprint are available for download. Harlequin’s catalog is difficult to locate on Edelweiss, but it doesn’t matter because of the 95 books on their frontlist, the 29 under the Kimani imprint aren’t available as ARCs. Though, to be fair, it seems that only 12 books on their frontlist are. Perhaps Harlequin just isn’t concerned about any of their authors. The bottom line is this, publishers can say they’re interested in diversifying their readers and their catalogs, but they’re not. Studies have shown that the most likely reader is an educated black woman. We buy and read books, yet publishing continues to cater to an audience that looks like them instead of us. The lack of people of colour in publishing is another topic that requires further discussion and perhaps we'll delve into that one day, but I digress. It doesn’t matter how well you write a book, if your publisher won’t promote it to reviewers and/or readers, who will know? I’ll continue to do my part by combing catalogs, looking for and promoting your books, but you’ve got to do your part and demand that your publishers start offering your books to any reviewer that reads your particular genre, not just the ones they think might be interested because we share the same skin tone. Adult women read YA all day, every day and they haven’t been teenagers in decades. I think they can find it within themselves to read a book with characters that don’t look like them if a publisher promotes it well enough.